The front of the CX-9 still has the popular design and the sharp curvature, the large metallic grill, the glass like Mazda Logo giving this model the classy, premium, and sporty look. 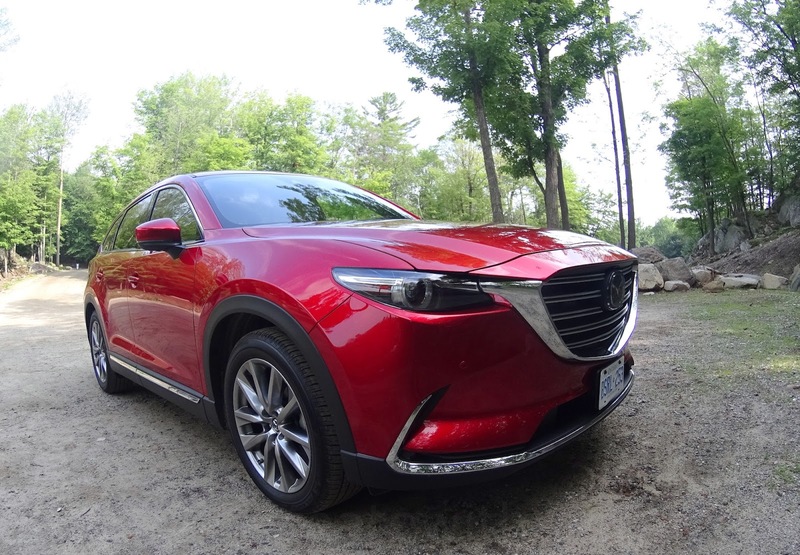 The CX-9 has a low, sleek design which makes it look longer than an average SUV. There are 3 rows of seats with the third row being pull up seats. The two seats in the third row can be pulled up easily to accommodate up to 7 people in the vehicle. The Soul Red Crystal metallic finish that we tested really shows off the bright LED lamps, the beautiful wraparound, the curvy shapes giving this design a thumbs up. There is a moon roof which tilts and slides over the front passenger seats. 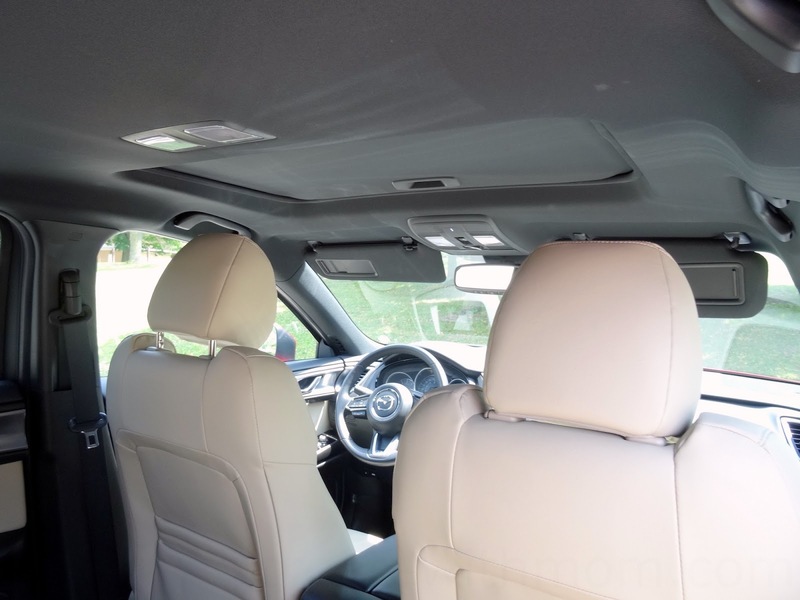 However, there is a no panoramic sunroof which is found in some of the other SUV's in this class. This might be an advantage to some as they are seldom used depending on the location and weather. There can also be a greater chance of noise, heat, and mechanical issues with having a panoramic sunroof. There is plenty of leg room for the front and rear passenger seats. While the third row seats are standard and serves its purpose of adding two more passengers, the legroom isn't much for adults compared to the first two rows but it is manageable for smaller trips because the second row can be adjusted. 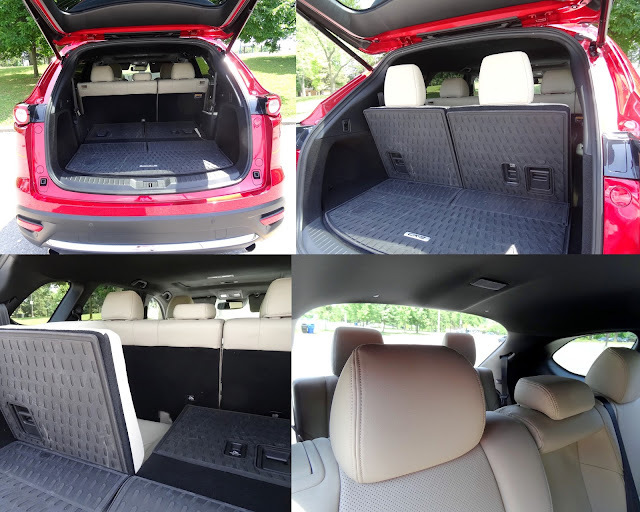 Without the third row seats being utilized, the cargo space goes in really deep giving plenty of ample space for storing everything for longer trips. With the third row seats folded down, the cargo floor is very flat making it easy to slide large pieces of baggage, which can be stacked on top of the other. The interior is luxurious with premium materials such as Nappa leather and subtle design touches with genuine aluminum and even rosewood trims. It is spacious and comfortable and has cup holders, USB power sockets, accessory sockets, and storage compartments, and pull down sun shades for the rear windows. The front row seats have power adjustment functions such as seat slide, height adjustment, seat recline, and driver lumbar support. Even with lumbar support I couldn't find a comfortable position for my lower back as the seat is more concave at the lower back position and found it slightly uncomfortable at times. I wish the lumbar support was a little bit more aggressive and offered a slightly higher angle of support. The driver's seat also has two memory positions to remember comfort settings. The steering wheel and the front and rear seats are heated for comfortable travelling in the winter. The rear seat heating can be independently controlled from the back. 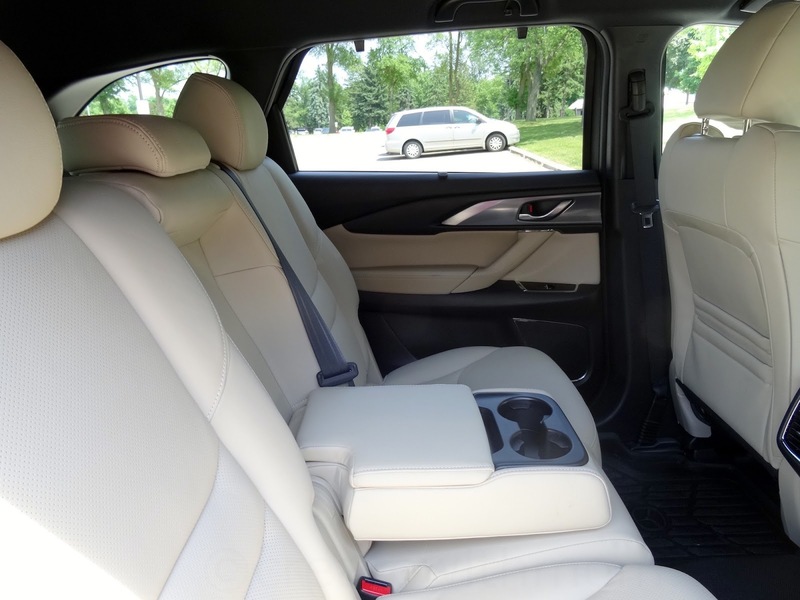 In between the rear seats, there is a spacious arm rest with a cup holder, which can be used to play games on. The CX-9 has a power tailgate that can be opened remotely with the key fob. Due to its curved design, we had to mind the corners of the tailgate as it was almost at eye level. We later realized that the tailgate height can be adjusted and be increased further by manually pushing the tailgate higher and pressing and holding the tailgate button.This will keep the preferred height in memory. 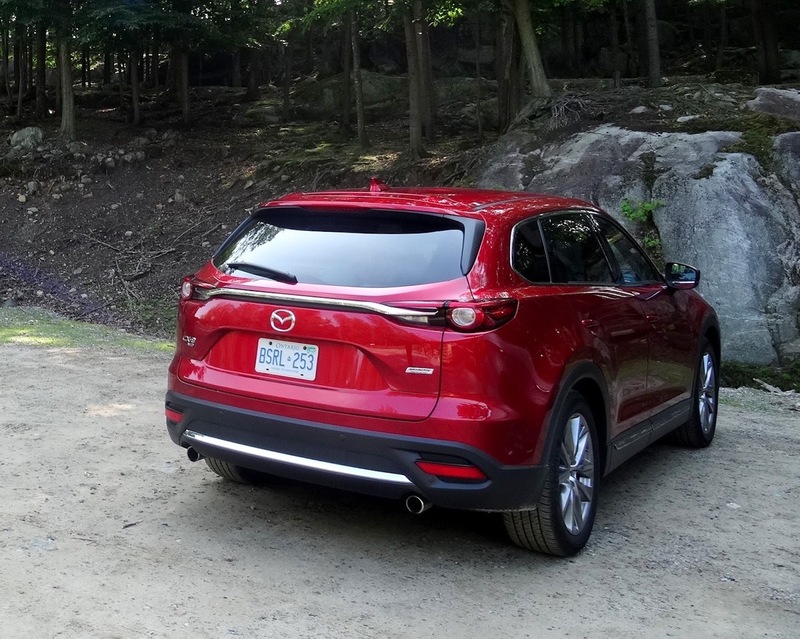 With the 2018 CX-9, Mazda has given extra focus on safety with numerous safety additions. 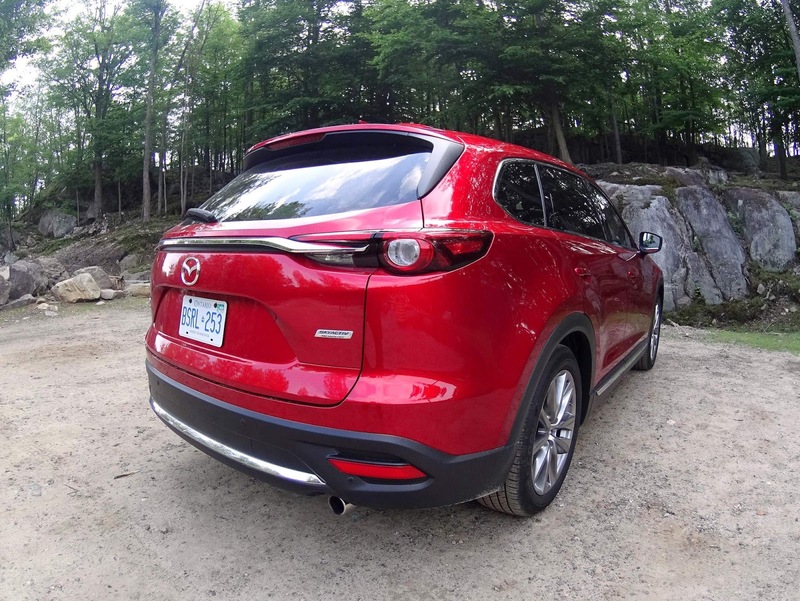 The CX-9 is equipped with i-ACTIV AWD which has 27 sensors monitoring the vehicle's every movement and adjusting and providing enough traction when needed. Mazda's i-ACTIVESENSE technology has several safety features added to help with highway and city travel. Mazda Radar Cruise control with Stop and Go function: Forward looking radar automatically helps maintain a safe following distance from the vehicle in front. Smart City Brake Support (SCBS): Helps to prevent or soften the impact of low speed collisions using a laser sensor by priming the brakes in advance. Advanced Blind Spot Monitoring System: Automatically detects blind spot objects on both sides and gives a warning. This is a really helpful when passing other vehicles. Adaptive Front Lighting System (AFS): when making turns the headlights pivot slightly to the direction of the turn to help us get an advanced look at any objects in the distance. Traffic Sign Recognition System (TSR): This feature uses onboard cameras to detect road signs such as speed limit, stop signs, and wrong way signs. There are others technologies such as Lane Departure Warning System (LDWS), High Beam Control System (HBC), Forward Obstruction Warning (FOW), and Lane Keep Assist (LAS) as well. Mazda has kept the Infotainment system similar to the models from previous years. This system is easy to navigate and the controls can be adjusted using the multifunction Commander Control. This easy to reach set of buttons are right at our fingertips. In the GT model we tested, it is equipped with a 12-speaker premium Bose audio system which provides surround sound throughout the vehicle's interior. 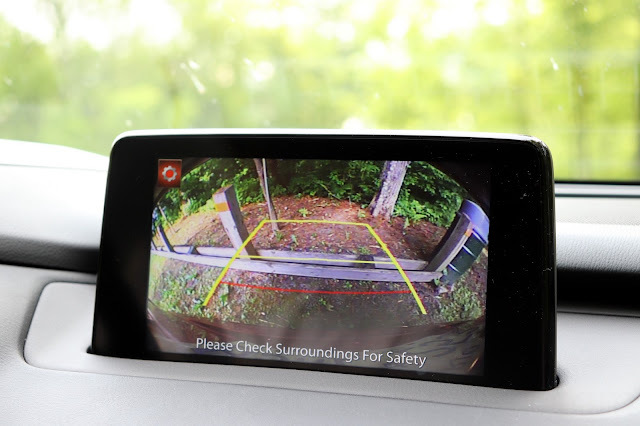 Another notable feature is the Homelink System, built into the Auto dimming mirror which can be programmed to activate multiple garage doors and gates. Our favourite feature is the Active driving display. The Active driving display projects important information on the windshield for the driver to see while keeping our eyes on the road. This display shows navigation instructions, speed, and safety alerts. It also displays alerts from the Traffic Sign Recognition system by warning us of stop signs and speed limit signs. The GT model has an 8 inch colour touch screen and navigation system. During Highway driving, on some instances we found the system couldn't differentiate the speed limit when passing an exit or a parallel road with a lower speed limit resulting in a speed warning displayed on the Active driving display and the navigation screen. This might be due to the Traffic Sign Recognition System (TSR) detecting the physical speed limit sign located on a highway exit. 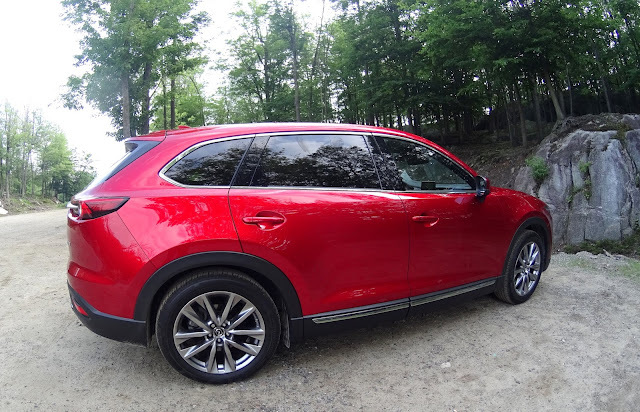 The Mazda CX-9 is fun to drive and it is definitely a driver's SUV. Although it has a large body it really feels like driving something smaller with lots of speed. For 2018, all CX-9 trims have a SKYACTIV-G 2.5 T 4-cylinder Dynamic Pressure Turbo Engine which provides enough power for smooth acceleration. Fuel economy is rated at 10.6 L/100KM for City driving and 8.4L/100KM for highway. We did better on the highway according to the fuel stats on the infotainment system showing 8.8L. Driving felt very smooth and refined without any lack of power as the vehicle handled long drives, curves, and descents with ease while it had fully loaded cargo and passengers. 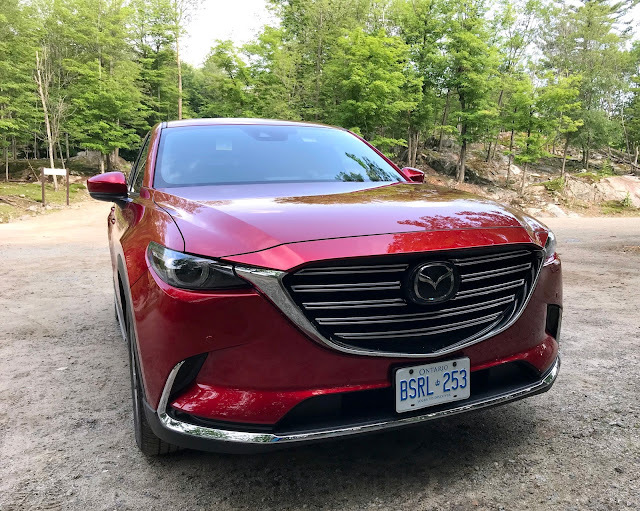 With the Mazda 2018 CX-9, the premium design, stylish interiors, abundant safety features, modern tech, peak performance - Mazda definitely has a positive trend going. Everything you could want in a car and more! really great car! thank you for the review! Sharp looking vehicle with a lot of add on features.